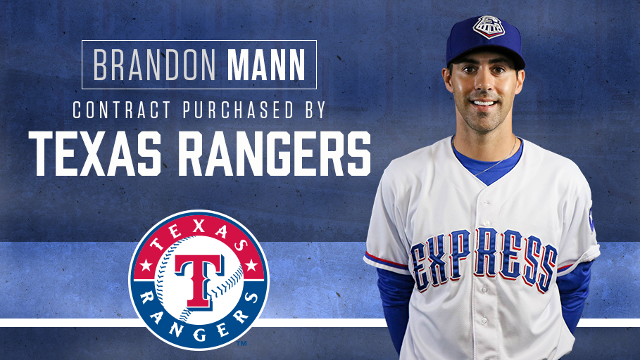 DES MOINES, Iowa - The Texas Rangers announced on Sunday morning that the club has purchased the contract of Round Rock Express LHP Brandon Mann . The 33-year-old is seeking his major league debut in what is his first career call-up to the bigs. This season marks Mann's first in the Rangers organization. He was a member of Round Rock's Opening Day roster and has compiled a 1-0 record with an impressive 1.04 ERA after allowing just two earned runs in 17.1 innings pitched across 11 relief appearances and one start to begin the year. He threw 10.0 consecutive scoreless frames to open the season and allowed just one unearned run in his first 16.1 innings across 11 outings. The lefty has followed a unique path to the big leagues. After being selected by Tampa Bay in the 27th round of the 2002 draft, Mann spent eight seasons within the Rays organization, never advancing past Double-A. Mann elected free agency following the 2009 season and signed with the Los Angeles Dodgers in 2010. After his release on August 19, 2010, Mann pitched for Southern Maryland of the independent Atlantic League. Mann then ventured overseas, playing for Yokohama of the Nippon Professional Baseball League in Japan. He returned stateside in 2013 but did not pitch again until 2014 after signing a minor league contract with the Pittsburgh Pirates. He was released in May and returned to the Atlantic League, suiting up for Lancaster in 2014 and Fargo-Moorhead in 2015. He returned to affiliated ball in 2016 after signing with the Oakland Athletics organization. Following time with Double-A Midland, he made his Triple-A debut with the Nashville Sounds on July 19, 2016, pitching in just one game before returning to the RockHounds. The lefty spent the duration of the 2017 season with Midland before signing with the Rangers on January 4, 2018. This season marked Mann's first extended time at the Triple-A level. The Express continue a four-game series against the Iowa Cubs on Sunday afternoon. E-Train RHP Tyler Wagner (0-1, 4.68) is scheduled to start against I-Cubs RHP Adbert Alzolay (2-1, 2.91). First pitch is set for 1:08 p.m.
Single-game tickets, season memberships and flex plan ticket packages are on sale now. For more information on the Express, visit RoundRockExpress.com or call (512) 255-2255. Keep up with the Express on Facebook, Instagram, Snapchat and Twitter!